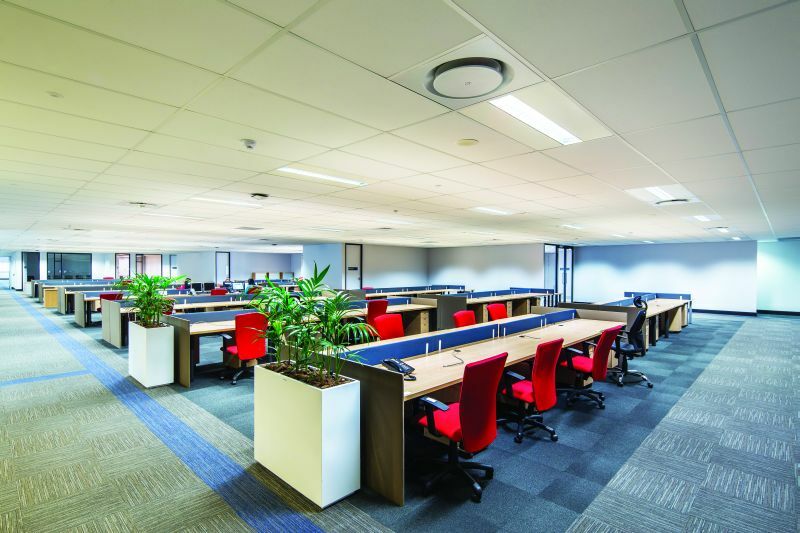 The new contact centre and regional head office for financial services group, MMI Holdings Limited, is one of the first commercial buildings in the Cornubia Business Hub development near Umhlanga in Kwa-Zulu Natal. This development node will, in time, encompass commercial, retail and residential areas, supported by a new BRT system. Developed by Eris Property Group, the MMI building consists of two office levels and one basement parking level and was designed to allow for future expansion and varying practices. The office areas have a deep open floor plan with large penetrations between the floors to allow for ample natural light. Since the building hosts a call centre, a high performance acoustic environment was required to enable an efficient working space. AMF Thermofon was specified for this application and was supplied by Pelican Systems. AMF THERMATEX® Thermofon is a mineral tile with excellent sound absorption values of 0.80 in high-frequency octave bands (H), a noise reduction coefficient of 0.85, sound attenuation of 28db and a RH (humidity resistance) rating of up to 95%. The white acoustic fleece creates a smooth surface and an elegant design. In the rest of the building, JUMBO Plasterboard and PS2 Shadowline Trims were used to fashion the flush plastered ceilings. For the transitions, Plaster Ceiling Junction was installed. This is a ceiling profile that facilitates the transition from an exposed tee ceiling to a flush plastered ceiling at the same level, creating a reveal between the two ceilings. In addition, 89mm JUMBO Drywalls were also specified and installed throughout the building in boardrooms, private meeting rooms and individual offices. The use of black powder coated aluminium, together with the white partitions and glass, created a striking, stylish and modern drywall look. With efficiency top of mind during the design of the building, the development was awarded a 4-Star Green Star SA Office v1 Design rating for its achievements in sustainable building features. Caption: AMF Thermofon acoustic ceiling tiles were specified to achieve the high performance rating required for the call centre application.